Botswana confounds many people’s opinions of Africa. Although still a relatively young country (it gained its independence in 1966) it is a well-run, thriving democracy where the income from diamond mining and tourism is spent wisely. Botswana is roughly the same size as Texas, but with the same population as Houston. (And rather than a lone star, the night skies of Botswana are fabled for their stellar displays of constellations). It’s a progressive nation, and is particularly forward-thinking when it comes to conservation: some 40% of Botswana’s land area is protected. 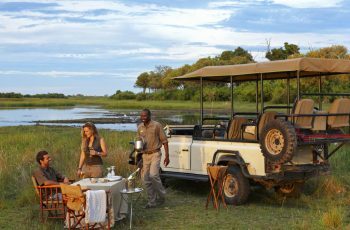 This adds up to Botswana being an awesome safari destination – safe and secure, and yet very wild in the best possible way. The beauty, scale and diversity of the landscapes will take your breath away, and while you’ll be sharing the savannah, swamps and woodlands with countless birds and animals, you won’t ever feel crowded. Botswana’s tourism policies manage visitor numbers for minimum ecosystem impact. 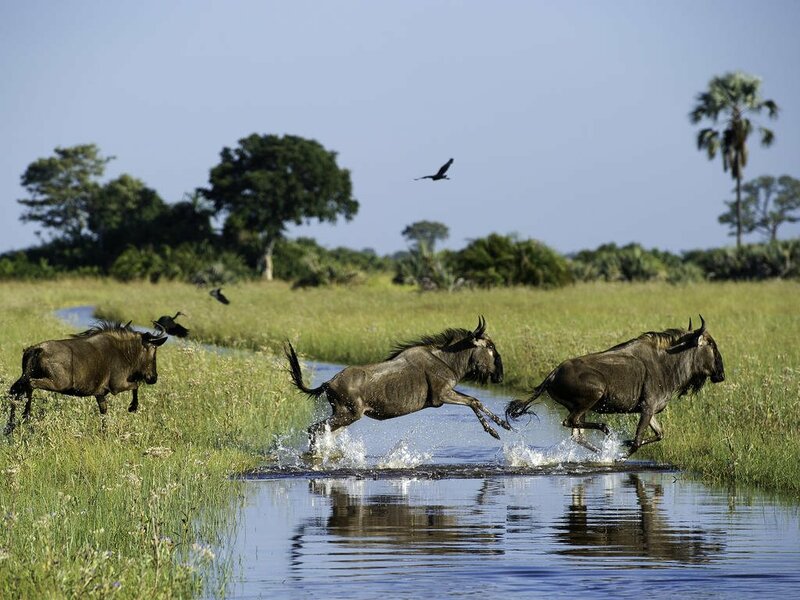 Botswana’s chief attraction is undoubtedly the Okavango Delta. Known as the “Jewel of the Kalahari”, this miraculous mosaic of wetlands, islands, floodplains and channels is revitalized each year by local rainfall, and by the annual inundation of water flowing down from the highlands of Angola. 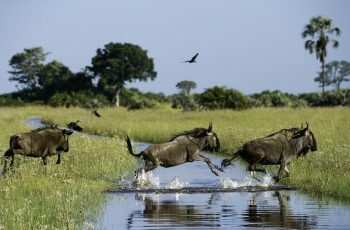 With the water being regularly recharged, the Okavango can support very healthy populations of all the species you would want to see on safari, and consists of beautiful and dynamic landscapes. 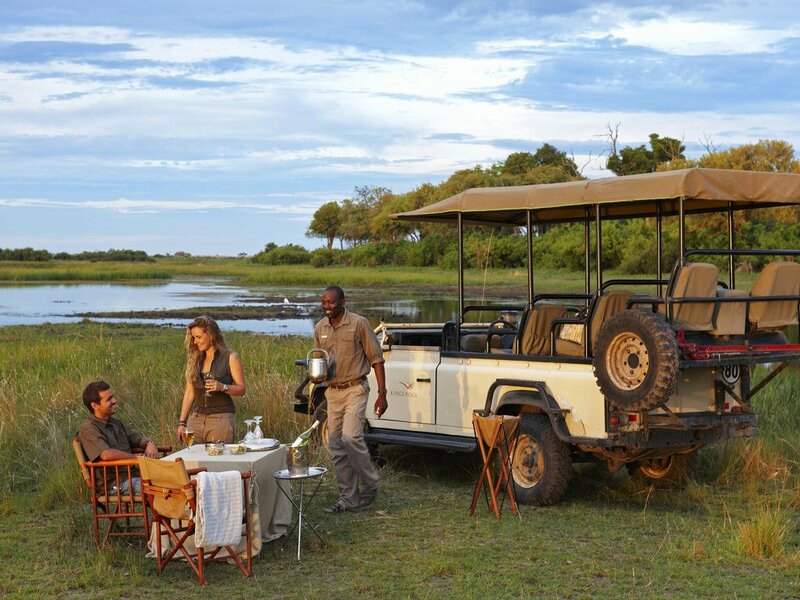 Unmissable experiences include game drives, walking safaris, and boat and mekoro (dug-out canoe) excursions. While the Delta steals much of the limelight, the rest of Botswana should not be overlooked. The immense spaces of the Central Kalahari (a desert which blooms and comes to life after the rains) and the almost-lunar Makgadikgadi Pans will give your imagination unlimited space to roam, while the Chobe National Park is the focal point for Africa’s greatest concentration of elephants. Cultural experiences include the opportunity to walk with the Bushmen (or San) and learn some of their survival secrets, and evenings spent listening to harmonious traditional a cappella singing. Intricately woven baskets make wonderful, baggage-allowance friendly souvenirs – and you should be sure to leave some space in your heart for all the wonderful memories you’ll make during your time in Botswana. Electrical sockets (outlets) in Botswana are the “Type M ” South African SABS1661 (“Large” 15 amp BS-546) sockets. If your appliance’s plug doesn’t match the shape of these sockets, you will need a travel plug adapter in order to plug in. Travel plug adapters simply change the shape of your appliance’s plug to match whatever type of socket you need to plug into. The US dollar, Euros, British Pound and the South African Rand are the most easily convertible currencies (and accepted by some estabishments – but, generally, then an inflated rate of exchange will be applied). Cash payments made to camps for curios and also gratuities need to be in one of these currencies. To check the current exchange rates, visit www.xe.com. Botswana’s currency is Pula (which means ‘rain’ in Setswana). It is divided into 100 thebe (which means ‘shield’ in Setswana)…. Visitors are advised to drink bottled or filtered water. Filtered water is available at most camps and shops offer bottled water. Milk is pasteurised, and dairy products, local meat, poultry, seafood, fruit and vegetables are generally safe. A discretionary 5 to 10% tip is typical for restaurant bills. In many places, a service charge is automatically added. Botswana’s climatic pattern is typical of southern Africa, although its rainfall is less than countries further east. The rains in Botswana come mostly between December and March, when average minimum temperatures are in the low 60°s. Some days will be bright and sunny, some will have afternoon thunderstorms, and some will just be grey. April and May in Botswana are generally lovely, with the sky clear and the landscape green. Night temperatures start to drop during these months, especially in the Kalahari. Note that places in and around the Okavango tend to have less extreme, more moderate temperatures than the drier areas of the Kalahari. This continues into September and October, when temperatures climb again, drying the landscapes and concentrating the game even more. 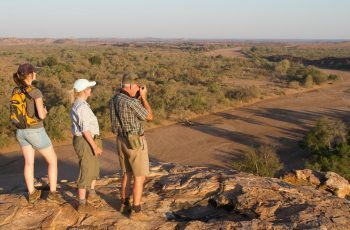 This is the best time for big game safaris – although October can feel very hot, with maximum temperatures sometimes approaching 100°C. Driving off the main roads in Botswana is only recommended in 4×4 vehicles, that are equipped correctly. Most lodges offer transfers or they can be arranged. If, however, you will be driving in Botswana: your home driving licence will be accepted (with an official English translation if necessary; driving is on the left side of the road; and the national speed limit is on tarred roads is 120km/h and 60km/h in towns and villages. Be sure to watch out for wild animals on the roads! In summer, lightweight, lightcoloured cottons are preferable. Avoid synthetic materials and black clothing, as they increase perspiration and discomfort. In winter, wear trousers, longsleeved shirts / blouses and jerseys. From May – August, night temperatures can fall below freezing, so warm jerseys and jackets are vital, especially on morning and evening game drives. Bring a lightweight jacket and/or jersey for unexpected temperature changes or rain. 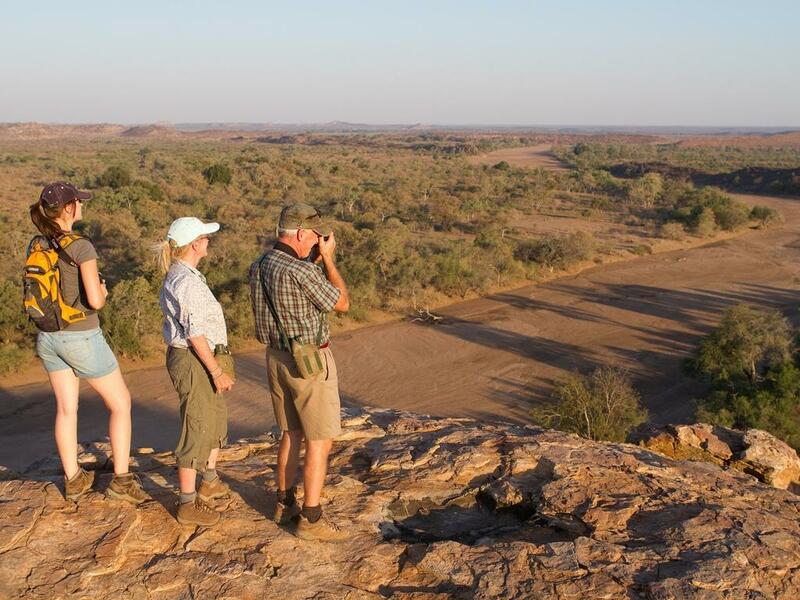 Garments of neutral colours that blend with the bush and forest are advisable for safaris and game viewing. Closed, comfortable walking shoes or gym shoes are a must in all seasons. Special attention should be given to protection from the sun. Bring a sunhat, good quality sunscreen, sun lotion and polarised sunglasses. Wide brimmed sun hats are essential. In summer, lightweight, lightcoloured cottons are preferable. Avoid synthetic materials and black clothing, as they increase perspiration and discomfort…. • Yellow Fever- required for travellers coming from a yellow fever infected country. It is otherwise not required or recommended. You should be vaccinated at least 10 days before you travel, as this will allow enough time for your body to develop protection against the yellow fever infection. Your proof of vaccination certificate will only become valid after this time. • Use plenty of mosquito repellent. Some camps provide a locally made repellent but please bring your own as there may be skin sensitivity. • Wear long-sleeved shirts and trousers/slacks in the evenings. • Please use the mosquito net over your bed where supplied/available. • If staying in a bungalow or tent, spray with a suitable insecticide to kill any mosquitoes that may have flown into your room. • Mosquito coils are also effective. Ticks are also well known as carriers of diseases that affect both animals and humans, and in Southern Africa this is referred to as tick bite fever. After walking in the bush it is best to brush your clothes down and to examine your body for ticks. If a tick is found, remove it entirely without leaving the biting mouth parts in your skin. Anti-tick sprays such as Bayticol can be very effective against ticks and wearing long pants will prevent many bites. Passports must be valid for at least 6 months beyond the intended departure date. Please ensure you have at least three blank visa pages (not endorsement pages) in your passport. U.S. citizens do not require a visa. Non U.S. citizens should consult with your local embassy. Children under the age of 18 travelling to or from Botswana require additional documentation. Airlines will deny boarding and Immigration will refuse entry or departure, if these requirements have not been met. The following website is a great reference: http://www.drivesouthafrica.co.za/child-visa-checklist/. Please contact your consultant at Alluring Africa for further clarification. What is an unbridged birth certificate? An unabridged (unedited/complete) birth certificate reflects the particulars of both parents. Do you have to have the original document? No, a certified copy of the birth certificate is sufficient. It must be certified as a true copy of the original by a Commissioner of Oaths. Do the copies of the parents’ passports/ID’s have to be certified? Yes, they must be certified as a true copy of the original by a Commissioner of Oaths. How do you obtain approval from the Director General when you do not reside in South Africa? Through the nearest South African diplomatic or consular representative abroad. A yellow fever vaccination certificate is required for travellers coming from a yellow fever infected country. It is otherwise not required or recommended. You should be vaccinated at least 10 days before you travel, as this will allow enough time for your body to develop protection against the yellow fever infection. Your proof of vaccination certificate will only become valid after this time. The national language is Setswana; however, the official language is English. Botswana is 2 hours ahead of Greenwich Mean Time (GMT) all year round. The telephone provider of Botswana is the Botswana Telecommunications Corporation. Another emergency telephone number of the country of Botswana is +27 82 558 7686. The people of Botswana or the tourists to Botswana can call in this number to report any problem or to meet any query. The telephone operators communicate in both English and local Botswana language.